I worked at a produce warehouse in Bakersfield California….we received produce by the truckloads and placed them into the appropriate storage room. We would then load trucks for the local stores 5 nights per week with the produce items they had ordered. The tomatoes we received were not any where near red when they arrive but 3 days later they were red and headed to the shelves at the local markets. What was magic about the 3 days? Answer: A room with controlled temperature, humidity and a big dose of ethylene gas. The tomatoes went into the room hard, firm( the hard and firm part is to help in transit) and with some evidence of a pink at the stem attachment, three days later, very red but still hard and firm tomatoes were sent out to the markets. It is no wonder that she didn’t like them! Along about 1982 she married me…..lucky for me and I suppose lucky for her too as I introduced her to “worldly” things like vine ripened tomatoes! She couldn’t believe how flavorful they could be. Her first taste of an Heirloom tomato, a Brandywine to be exact, blew her mind. Her comment was that it tasted like a perfect tomato with a dash of salt…..but no salt was added. Unfortunately I struggle to grow Brandywine tomatoes here in Houston but Bakersfield was perfect for them. On the patio near the house I keep a determinate variety of tomato for her pleasure. She can keep a daily eye on it and removes the ripening tomatoes before her friends, the damn squirrels, can get to them…..I have proposed a solution for the squirrels but she won’t acquiesce. The patio plant sans ripe tomatoes….they have been removed before tempting the squirrels. One of her favorite combinations – vine ripe tomatoes, cucumbers and red onion(not shown) No ethylene gas room used in the ripening of this tomato…..unharmed in the natural process! Whatever ratio of chopped tomatoes and quarter slice cucumbers that you desire. Chopped red onion to flavor and mix with a 50/50 mix of an Italian dressing and Ranch dressing. Let marinate for a bit…..she usually can’t wait, still taste heavenly! I will sometimes add fresh ground black pepper to my bowl. The Sweet Million cherry tomatoes are kicking in and they can also be used….usually just cut in half. I have a couple of Roma Tomato plants that are loaded up with green tomatoes and lots of blossoms. Bee stuff for a moment. I extracted a couple of supers last week and put them out in the garden for the local bees, not my bees, to clean up before returning to their respective hives. They do a great job and helps the local feral bee populations. I hope you have access to vine ripened tomatoes….if not try a Farmers market but be picky. If you spot produce boxes behind the tables ask questions about the source!!!!! A gentle squeeze test will also indicate whether the are vine ripened or coerced into turning red…..not ripe but just beautiful red! I picked several handfuls of carrots today. 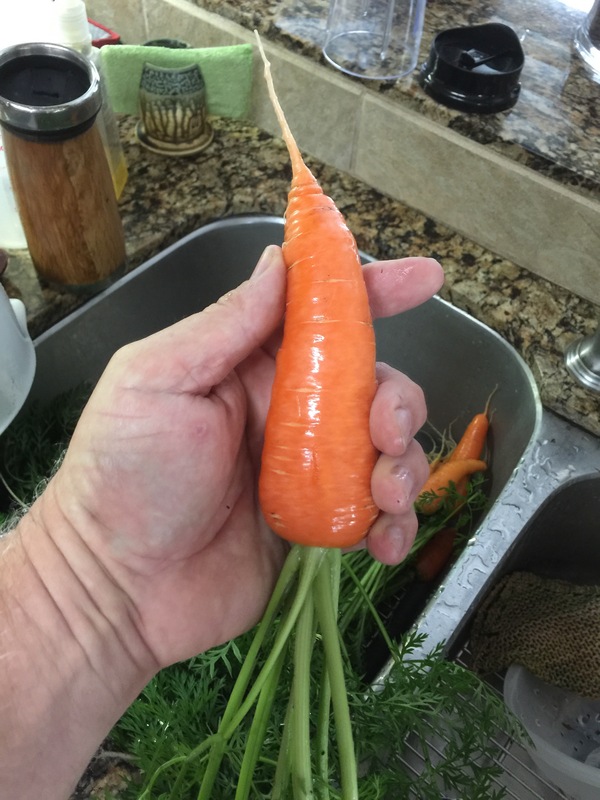 The Houston clay soil makes carrot growing difficult at best. 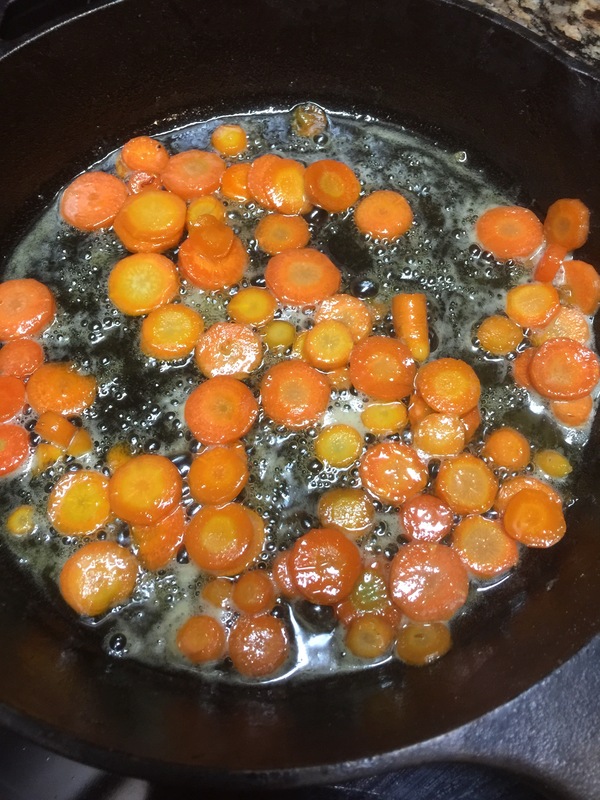 These carrots were from a bed that is about 4 years old. The soil is beginning to loosen but I still wind up with many two, three and sometimes four legged carrots. Roasting size. I grow Danvers Half long and Scarlet Nantes varieties.? Today’s bigger carrots will be destined for roasting. The small ones were cut thin and sautéed in butter. I added a little sea salt for flavor and halfway through I drizzled some of my raw honey over the simmering morsels. Cooked just long enough – not too soft and not too crunchy. The only complaint…..I didn’t make enough. Next time Hun!